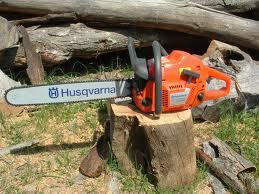 Here at County Durham Logs we offer full chainsaw servicing and repair from a professional service to a full rebuild. All makes repaired including Husqvarna and Stihl. Not only do we repair and service chainsaws, but we can also extend this to any petrol engine garden machinery including lawnmowers, strimmers, hedge cutters etc. Chains can also be made up to order to your specification. Prices start at only £7 for a chain up to 16 inch. If you require anything larger than this then please contact Mark on 07779 247971 Monday - Friday 10am until 7pm, or Saturday mornings. We can also provide sundry items such as sharpening files, chain oil, low smoke 2 stroke oil and spark plugs. Second hand chainsaws are also bought and sold - come and visit us or give us a call.